28"L x 34"H. Grades PreK-1. Being that B has just started school, the princess has been eager to do some learning of her own...in her quest to always match her brother at whatever he's doing;). Learning Resources is such an amazing store with so many unique learning tools. After browsing to through the site, I was excited to come across their Pocket Chart's! The princess has been growing increasingly interested in letter's and spelling - and I knew that this would be just the right tool to set her off in the right direction. We have had a wonderful time setting the mat out and placing the cards in their appropriate pockets ( when I get around to it we will eventually hang it in the playroom). The princess Love's matching the pictures with their appropriate letter...and is getting better at it by the day! With a large display, the chart is definitely age appropriate, and allows for letter recognition (laying the foundation for reading), and a variety of letter activities. This wonderful hands on learning tool is making it so much easier to teach the princess her alphabet (and beginner spelling)! Experience the Alphabet Center Pocket Chart with your little one's! One Lucky Reader will receive a Alphabet Center Pocket Chart of their own! 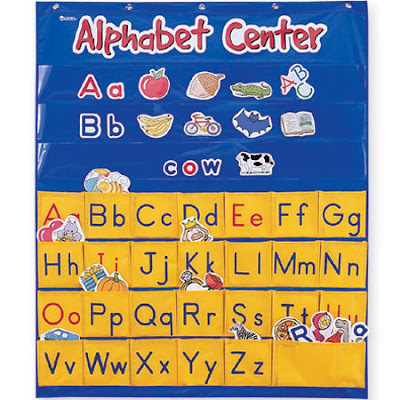 Leave a comment~ Which other product (aside from the Alphabet Center Pocket Chart) from Learning Resources would you love to have for your child? The comment is considered your entry. i would love the counting cans!! fabulous product to learn math! I'd love to have the Let's Tackle Kindergarten Box for my daughter! My son had troubles with colors so I love the rainbow sorting crayons. I would love to try the 1 to 10 Counting Cans Sounds like a great company! I love the teaching cash register! I follow you thru gfc. I would love the Vega 600™ Telescope. Hello, I follow on GFC follower and another toy we would love is the Teaching Cash Register. Thanks for a great giveaway! I would like the rainbow counting crayons. I would love the "A Bee C Buzz" game to help my children with spelling and letters. #2 I am a follower. #1 I entered the TI-Nspire giveaway. #2 I entered the TI-Nspire giveaway. #1 I entered the 3G Kindle giveaway. #2 I entered the 3G Kindle giveaway. #1 I entered the Children's place giveaway. #2 I entered the Children's place giveaway. #1 I entered the safety 1st giveaway. #2 I entered the safety 1st giveaway. I would also love to have the Hip Hoppin Hundreds Mat! Thanks! Oh how adorable! I'd also like to have the Ticks Tacks Toes game! How fun!